Where are El Rito topos? Welcome to the home of "North American Classics". We now host the entire content of the original CD......enjoy! The Los Alamos Mountaineers Club is honored to host one of the most influential climbing sites in the history of the sport. Gary Clark, the editor, has been a member of the Mountaineers for many years, and is one of a select few to be honored as a "Lifetime Member". Note: This project is not currently accepting contributed photos, trip reports, or other material. However, if you have a new route description or topo diagram, or something else outstanding; contact the editor by clicking here". Copyright Notice: All material appearing on this site is original work for which copyright protection is retained by the originators. You may make any personal use of it, but may neither reproduce, publish in print or on any Web site, nor utilize for any commercial purpose. Please contact us for further rights for any of this material. Warning: No book, class, web site, or advice from others is a substitute for individual experience, expert instruction, and judgment. Climbing is a dangerous sport, and you can be injured or killed even when prepared with the best available information. 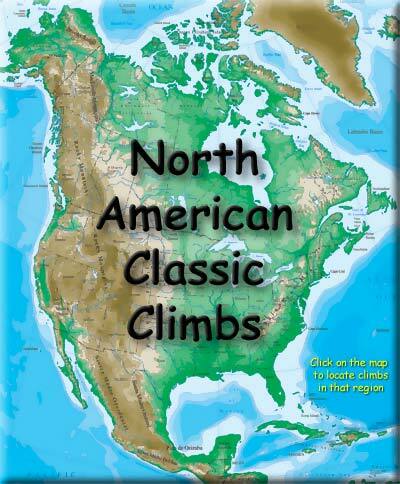 No warranty, expressed or implied, is made as to the accuracy or adequacy of information on the North American Classics web pages or the Los Alamos Mountaineers website.